Justine's Cardmaking: Create a Smile Stamp's Snow Dance Video Hop! Create a Smile Stamp's Snow Dance Video Hop! I have an amazing kit to show you - and I'm not the only one. We are having a VIDEO HOP! 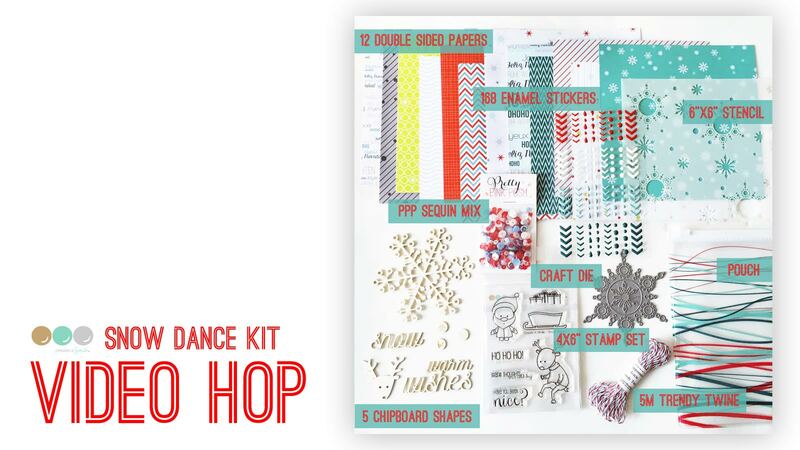 Which means there are TEN video tutorials to give you amazing ways to use this card kit! There is a GIVEAWAY for the kit over at Create a Smile's Blog so be sure to go over and check it out! Check out the VIDEO HOP HERE! Just start by clicking the link above and you will be linked to each video :) Grab a coffee and get ready to be inspired! Supply List will be available tomorrow! I'm an avid cardmaker who enjoys teaching others how to be creative. I am currently living in Thunder Bay, Canada and I work as an elementary teacher during the day. I enjoy traveling and reading in my spare time. Awesome card!!! Love the deer peeking through the cut out snow flake!! Cool design! Neat card! This snowflake die is really nice. Your video is fantastic, the kit, amazing, your card, fantastic! I think this sweet reindeer and fabulous snowflake should come to live in my snowy Rocky Mountains town! Wow! Love what you've done with this kit! Your snowflake pops from the page! Love that die. . .Thanks for your inspiration and video! I love love love this kit and all the wonderful extras you get. You did such a great job making an adorable card. I love your design. Great job! and thanks for sharing. Beautiful card. Loving this snowflake die more and more. Justine I love your card. This kit is adorable and your card really shows that fact. Good work. Gorgeous card. I love he reindeer popping out to offer warm wishes! Cute use of the reindeer in the window of the die cut. Great card. Very pretty. The die cut is so elegant. The red background really highlights the reindeer looking out. I am SO excited about this kit and really hoping to be able to purchase one. I am also excited to have found you, I don't know how I didn't know about your blog or your YT channel, but I am now a subscriber to both! I love your card and can't wait to see what other wonderful things you create. Thank you for sharing your talent and inspiration with me. Great card! Thanks for being part of this amazing hop! The reindeer image is so cute and so perfect for this window snowflake creation, Super cute! What an adorable card! So sweet! Such a fun card, love this kit! So cute!! Love the reindeer. That is one big beautiful snowflake die, and what a great idea to use it to frame the dancing reindeer. Wonderful job with Create a Smile's new kit! BEAUTIFUL CARD! LOVE THE KIT! Absolutely lovely card. The kit looks awesome. Your comments really make my day! Thank you for considering leaving one! I'm Justine -I love everything papercrafting, especially making cards to send to others. I am an elementary school teacher and enjoy teaching both in the classroom and the craft room. I hope everyone finds something inspiring to create after reading! Contact Me Personally! BLOG COMMENTS SCROLL UP!